Sister Audrey Martin, 84, a member of the Benedictine Sisters of Annunciation Monastery, Bismarck, entered eternal life Dec. 27, 2011, at a Bismarck care center. Sister Audrey was born March 5, 1927, in Bismarck to Anna Marie (Fischer) and Nick Martin. She was the 7th of 10 children and given the name Alberta Agnes. She attended St. Mary’s Grade School and St. Mary’s High School in Bismarck. After high school, Alberta entered the newly established Annunciation Monastery. In 1947 she was among the first class of novices at the new monastery and received the name, Sister Audrey. She made monastic profession on July 1, 1948. 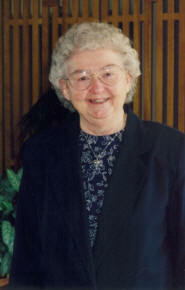 A cheerful, outgoing person of faith, Sister Audrey enjoyed people and, as she once said, “had varied and happy careers.” She taught for 25 years in elementary and high schools in Dickinson, Bismarck, Mandan, and at St. Lawrence School in Flasher where she also was principal. Sister Audrey was a wonderful, creative, well-organized educator. A favorite teacher among the children, she loved her students and they knew it. She earned a bachelor’s degree in education from the University of Mary and a master’s in education with a concentration in guidance and counseling from North Dakota State University. Sister Audrey served as director of vocation ministry and director of sisters in first monastic profession at Annunciation Monastery, counselor at St. Mary’s Central High and as subprioress of the monastery. She was also director of Annunciation Monastery’s oblates for five years. After receiving archival training, she established the first on-site archives at St. Alexius Medical Center. From 1993-1999, she organized the medical center’s archives and electronically catalogued its contents. She later became archivist at the monastery and moved the archives from the former monastery to the new site in 2000. Sister Audrey had a great sense of humor, a hardy laugh and an excellent soprano singing voice. She came from a close family and enjoyed family gatherings and reunions. She loved her family and they were so good to her. She was especially close to her mother and visited her frequently. While she was in the care center, she delighted in having company and was delightful to be with. Her happy eyes and smile lit up as she welcomed visitors. Often she would sing for them. She will be missed by all who knew and loved her. Sister Audrey is survived by two sisters, Virginia (Julius) Brigl, Bismarck; Rose Schafer, Tacoma, Wash; three brothers, Clarence, Bismarck; Francis (Akiko) Santa Ana, Calif.; John, Antelope, Calif.; a sister-in-law, Mary Martin, Bismarck, and the Sisters of Annunciation Monastery.